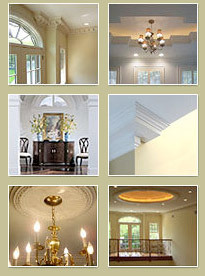 Frieze molding is often used as a larger Panel Molding to form panels on ceilings or walls. A wall frieze can also be used to create a dividing line, making the space more intimate, and minimizing the vast scale and empty feeling of expansive rooms or high ceilings. Decorative frieze molding is most common in neo-classical architecture. Our wall frieze moulding and frieze molding come in a variety of styles and motifs. © 2010 Lancrest Moldings. All Rights Reserved.